Free shipping. Buy direct from HP. 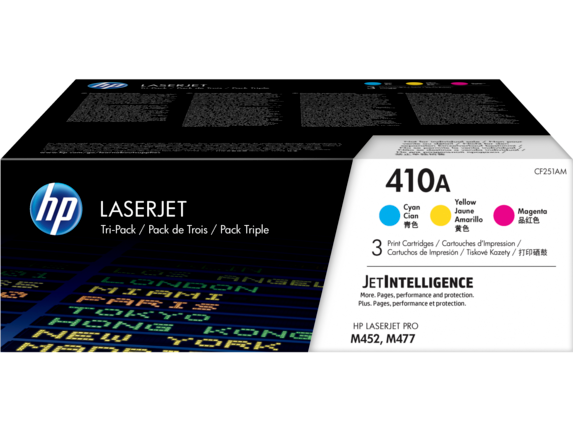 See customer reviews and comparisons for the HP 410A 3-pack Cyan/Magenta/Yellow Original LaserJet Toner Cartridges. Upgrades and savings on select products. Continue to count on professional quality at high speeds with HP ColorSphere 3 toner.Look professional on every page with vibrant, high-quality color prints that help your business look its best.Keep energy use down—Original HP Toner cartridges with JetIntelligence help your HP printer consume less. Print for longer than before and get more pages with optional high-yield cartridges.Intelligently track toner levels with print gauge technology to help ensure you get the pages you paid for.Print more pages and replace cartridges less often with optional Original HP High Yield Toner cartridges.